Crevillente (Crevillent, in valenciano) is a small town located at the foot of the hill range known locally as Serra de Crevillent, in the region of Baix Vinalopó in the Alicante province. Crevillente maintains the typically urban layout: first the old or Moorish quarter, with strong Muslim, and secondly the typical cave dwellings. And, second the modern Crevillente with it modern buildings. Surrounded by greenery, it is proud of its traditions, and culture, making its principal activity an art form. 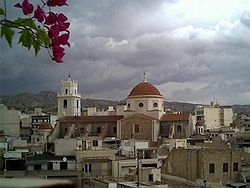 Crevillente shows distinct urban plots: first the old or Moorish quarter, with strong Muslim, and secondly the typical cave dwellings and, secondly, the modern Crevillente of existing buildings. The town of Crevillente is locally better known as "Cuidad del Alfombras" meaning "City of Carpets". Its hand-woven carpets are world-renowned for their quality and original designs that take their influence from the Orient whilst its Islamic architecture is interwoven with cave houses carved out of the side of the mountain, one of the few parts of the region that you can find these unusual properties. Abundant findings testify to the passage of different cultures: the upper Paleolithic, around 18,000 to 20,000 years the Chalcolithic in the third millennium BC, the Bronze Age, the end of III millennium and first half of the second millennium BC, the Bronze Final and the Orientalizing Period, 850-550 BC, the Iberian centuries V - IV BC, the Roman remains found in the VI century BC to AD. In 1296, with the conquest by Jaime II of Aragon the southern province of Alicante (Castilian-dominated), the Ra'ís Crevillente (Muhammad ibn Hudayr) signed an act of allegiance and full submission to the Crown of Aragón. In 1305 the city which was part of the lordship of Elche joined the Kingdom of Valencia by the award of turrets. Jaime II rewarded the Ra'ís with the institutional status of "ordinary courts" of Muslims in the province of Alicante, while it confirmed in the possession of his dominion. The population remained predominantly Muslim during the next three centuries. In the early seventeenth century, Crevillente’s population consisted of just 400 families, of which most were Moors. With the expulsion of the Moors in 1609, its population was further reduced. However, during the War of Succession in the 18th Century it was taken over again by King Borbon and Crevillente enjoyed peaceful times. Crevillente’s economy dates back to the Middle Ages, is the production of hand-woven carpets. Now easily recognisable all over the world by the Alfombras de Crevillente logo borne by each and every one, rugs from this region are made almost exclusively from natural fibres and mirror very closely the designs found in the middle east and Asia. Crevillente has a number of beautiful parks, gardens and tree-lined avenues where you can take a leisurely stroll and enjoy the view. The most noteworthy of these is the Parque Nuevo on the Elche road, watched over by the neoclassical Casa del Parque, which houses the archaeological museum and municipal art collection together with the old laboratory of Crevillente-born Doctor Francisco Mas Magro, a medic whose investigation in the field of haematology made him a Nobel Prize candidate. Crevillente is also blessed with some of the most attractive views and spectacular natural countryside in the Alicante province, with the Montaña de San Cayetano and El Hondo nature reserves found right on the doorstep. See below to view a selection of our bargain properties in Crevillente.